In the Twelfth and Thirteenth Centuries. On Jewish Life in Russia. A composition either in verse or in prose, modeled more or less closely on an original work, or class of original works, but by its method of treatment turning the serious sense of such original or originals into ridicule. Closely allied to parody are the forms known as travesty, burlesque, and mock-heroic. The technique of the parodist has some interesting features well worth description and illustration. One may parody a well-known passage or verse by merely using it in a playful sense, without making in it any change whatever. Abraham ibn Ezra thus parodied the benediction "Praised be Thou who formest light and createst darkness" by applying it to the white neck and dark hair of a pretty brunette ( ). A wrong pause or accent will sometimes make a passage parody itself. Thus it is said of an inexperienced ḥazzan that he ran the first and second sentences of the seventh chapter of Genesis together, making God say unto Noah: "Come thou and all thy house into the ark; for thee I have seen righteous before me in this generation of every clean beast." Perverted proverbs form still another class of parody. In its incipient stage parody was not far removed from pure imitation. This may be gathered fromthe fact that some parodies have been admitted into the ritual, which would have been impossible if they had not been regarded as mere imitations. As an example of this kind may be mentioned Menahem ben Aaron's "Hymn for the First Night of Purim," a drinking-song far removed from the spirit of the liturgy, nevertheless embodied in the Maḥzor Vitry. Hebrew parody may therefore be said to have been slowly evolved out of imitation, passing first from the serious to the playful, and then from the playful to the humorous and satiric. Unlike parody in general literature, it did not spring from a desire to disparage, but from a desire to emulate. It was not until the twelfth century that parody was met with in Jewish literature. Early in that century Abraham ibn Ezra penned his famous epigrams, some of which have an element of parody in them. He was perhaps also the first to write in the mock-heroic style. His poem on "Flies" is of this kind. It was probably in the same century that Menahem ben Aaron wrote the "Hymn for the First Night of Purim," mentioned above, and Joseph Zabara composed his satires on women, which contain a number of parodies. In the thirteenth century Judah al-Ḥarizi is the first to attract attention as a parodist. He was the first to transform parody from a mere literary toy into an instrument of satire. His satire is best exemplified in the tenth and twenty-fourth chapters of the "Taḥkemoni." Contemporary with Al-Ḥarizi was Judah ben Isaac ben Shabbethai, who wrote a few unimportant parodies. For the next seven decades after Isaac ben Shabbethai, parody was at a standstill; and it was not in Spain, but in Provence and Italy, that it began once more to show signs of life. The more important attempts at parody in France and Italy date from the last decade of the thirteenth century. One of these is Abraham Bedersi's eulogy on Abulafia, couched in the language of the Passover Haggadah. It was also about this time that Immanuel of Rome began to write his satires. As a parodist, Immanuel's position is unique in Hebrew literature. Although there is little in all his writings that is true parody, there is a parodic thread running through the web of his satires, which, if drawn out, might be woven into a cloth of its own—a Biblical parody. It was not, however, until the middle of the fourteenth century that parody showed signs of becoming a separate branch of literature. Somewhere between 1319 and 1332 three parodies were written which raised this form of satire into a distinct art. These are the "Masseket Purim," the "Sefer Ḥabaḳbuḳ ha-Nabi," and the "Megillat Setarim." The first is definitely known to be the work of Kalonymus ben Kalonymus, the third has been almost as definitely proved (by Neubauer) to be the work of Levi ben Gershon, and the second seems to be the work of the same French scholar and philosopher. In these three works parody attained an individuality of its own. For the first time two men of renown ventured to use Talmudic passages playfully. The numerous anecdotes and various customs associated with the riotous season of Purim are related in the solemn style of the Mishnah and Gemara. The satire of the "Masseket Purim" is of a mild kind. It ridicules the drunkard and the glutton, laughs at the miser, and reproaches the idler and the professional mendicant; but in it society as a whole is nowhere attacked so fiercely as in the "Eben Boḥan" of the same author. As a parody of the Talmud, "Masseket Purim" copies the original not only in style and diction, but also in the manner of discussing dissimilar subjects at one and the same time. No less clever are the parodies of Levi ben Gershon. But while the humor of Kalonymus approaches more the grotesque, and his satire is directed against the scum of society, the humor of Gersonides is a species of wit. His satire is directed against no one in particular; occasionally he laughs at himself and at his own jokes, and he delights in puns and anachronisms. These parodies, which deal exclusively with Jewish life, are succeeded by a few parodies of anti-Christian tendencies. The Haggadah of Jonah Ropa, identical with "Pilpul Zeman Zemannim Zemannehem," was written about 1380 by a resident of Vercelli, and is still in manuscript. It is a vehement denunciation of the licentiousness indulged in by Gentiles during the carnival. Another anti-Christian parody was written by Elijah Ḥayyim ben Benjamin of Genazzano between 1490 and 1500. It is in the style and metrical form of the hymn "Yigdal," and breathes a harshness born of persecution. With the anti-Christian polemics, parody closed its first period of growth, after which followed a period of decay that lasted almost three centuries. In the sixteenth century the names of only Modena and Najara are associated with parody. Modena parodied the well-known verses against gamblers ("Ḥaruz Neged ha-Ẓaḥḳanim") ascribed to Ibn Ezra, turning them into a panegyric on the gambler ("Ḥaruz be-Shebaḥ ha-Ẓaḥḳanim"), and Najara parodied the formula of the Jewish marriage contract ("ketubah"), in which he speaks of God as the groom, Israel as the bride, the Torah as the dowry, and the laws deduced from the Torah as the additional endowment ("tosefet ketubah"). The seventeenth century was even more unproductive of parodies than the sixteenth. An insignificant Talmudic travesty by Joshua Calimani and a few anonymous parodies called "Haman Edicts" are all that have come down from the former period. The only exception is the "Masseket Purim" of 1695, which in its revised form has even surpassed the parody of Kalonymus in popularity, and is to-day by far the most widely known composition of that name. Although it was not published in its revised form until 1814, it must have been extensively copied and spread abroad. It has the true ring of Talmudic argumentation, and is also supplied with parodiesof the three best-known Talmudic commentaries: Rashi, the Tosafot, and the novellæ of R. Samuel Edels. The distinctive feature of this parody is the relation which it establishes, by Talmudic methods, between well-known historic events and the day of Purim, the effect of which is very droll. To cite one example, the day on which Miriam, the sister of Moses, died was Purim, for it is written "and there was no water for the congregation," which can only happen on Purim. The greater part of the eighteenth century has no single parody which may be pointed to with pride; for, though the "Burlesque Testaments" and parodies of the requiem first came into vogue in the early part of the century, and although there are parodies by David Raphael Polido, Samuel Mendes de Sola, Isaac Luzzatto, Wolf Buchner, and several others, none of them has any great literary merit. It was only in the closing years of the century that parody showed signs of revival, in the works of Judah Löb Bensew and Tobias Feder. Bensew's "Seder Seliḥot le-Purim" is a hymnal for the worshipers of Bacchus, a book of devotion for lovers of wine and music. Tobias Feder was the first to introduce the Zohar parody. His "Zohar Ḥadash le-Purim" may be regarded as a forerunner of the satiric parody and the link between the parodies of the eighteenth century and those of the nineteenth. 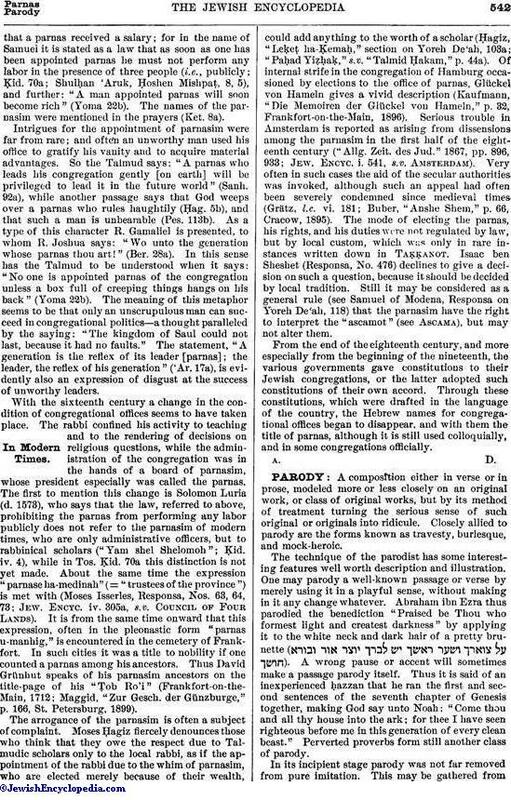 The chief characteristic of the parodies of the nineteenth century is that they have a direct bearing on life and reflect the spirit of the times; for almost all social, religious, and even political questions of the day engaged the attention of the modern parodist, and called forth either his ardent support or his vigorous protest. The earliest parodies of the century are directed against the Ḥasidic sect and the cult of those who figured as "Ẓaddiḳim," or pious men. The first of this kind is the "Megalleh Ṭemirin" of Joseph Perl of Tarnopol, published in 1819. It is a biting satire, revealing all the hypocrisy and corruption of the Ẓaddiḳim, and is modeled after the well-known "Epistolæ Obscurorum Virorum," the corrupt Hebrew taking the place of the dog-Latin. The next parody belonging to the group of epistolary satires is "Dibre Ẓaddiḳim" by Isaac Bär Levinsohn, published in 1830. This is more of a satire on the perverted homiletics of the Ẓaddiḳim. Mention must also be made of the following: "Ḥasidut we Ḥokmah" by I. Erter (in "Ha-Ẓofeh," ch. vi. ); "Hitgallut ha-Yenuḳa bi-Setolin" (in "Ha-Shaḥar," vi. 25-44), which was probably written by M. Shatzkes and J. L. Levin conjointly; "Zwei Chasidim" (parodying Heine's "Zwei Grenadiere"), written by Goldberg, though included in Gordon's collection of Yiddish poetry; and J. Ralbe's "Haggadah shel Pesaḥ" (in "Ha-'Ibri," iii., No. 14). The Reform movement likewise elicited a number of parodies, the most important of which are the "Tiḳḳun Shabbat Ḥadash" of Moses Mendelssohn (in his "Pene Tebel," pp. 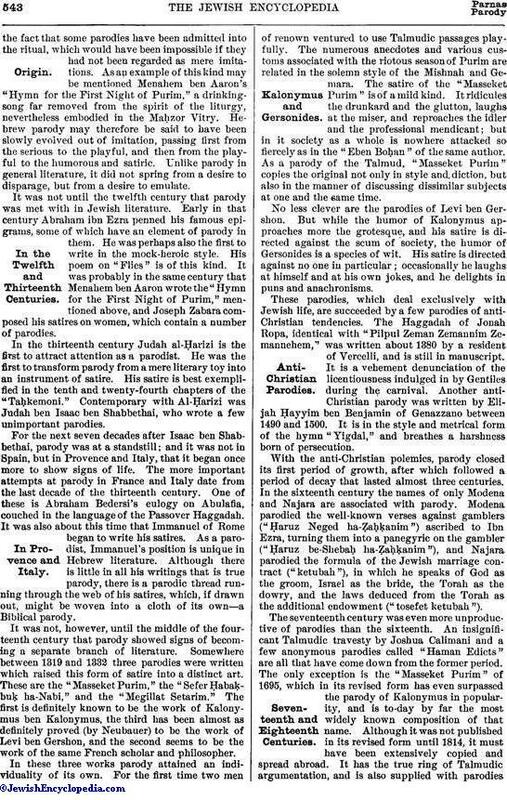 173-174, Amsterdam, 1872) and the "Zohar Ḥadash" of J. L. Nathan (Sachs, "Kanfe Yonah," pp. 21-25). Parodies of socialistic and revolutionary tendencies are quite numerous. The chief contributors are A. Cahn, B. Feigenbaum, I. Kaminer, and M. Winchewski. But there are also a large number of anonymous parodies of great satiric power, the most important of which are "Mishnat Elisha ben Abuyah" (in "Asefat Ḥakamim," Nos. v.-viii.) and "Tefillah Zakah Ḥadashah," No. 7, 1900. The parodies on the manners, morals, customs, and conditions of the Jews in Russia form a literature in themselves. Only the names of the more important authors can be mentioned here, viz. : J. Brill, I. Kaminer, A. S. Melamed, J. S. Olschwang, A. Rakowsky, and L. R. Simlin. Equally numerous are the parodies dealing with Jewish life in America. The greatest of them all is the "Masseket Amerika" by Gerson Rosenzweig. It presents the life of the Jewish immigrant in a humorous light, and is unquestionably the cleverest of all Talmudic parodies. Mention must also be made of A. Kotlyar's "Masseket Derek Ereẓ ha-Ḥadashah" (Pittsburg, 1893), E. Deinard's "Sefer ha-Kundes" (Newark, 1890), and the parodies of D. Apotheker scattered in various periodicals. Of the parodies dealing with literary topics the following deserve special mention: J. Brill's "Mishnat Mebakkerim" (in "Ha-Shaḥar," viii. 317-324) and "Midrash Soferim" (ib. x. 81 et seq. ), both dealing with the principles of literary criticism, and the parodies of Bader, Kaminer, and Linetzky. 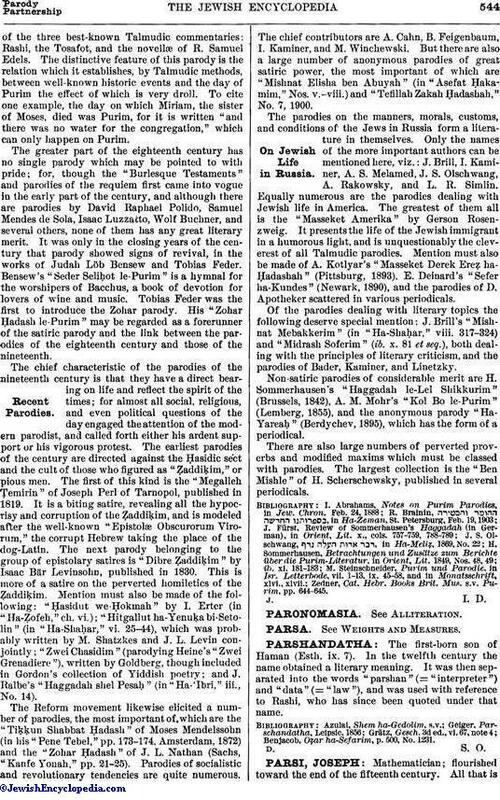 Non-satiric parodies of considerable merit are H. Sommerhausen's "Haggadah le-Lel Shikkurim" (Brussels, 1842), A. M. Mohr's "Kol Bo le-Purim" (Lemberg, 1855), and the anonymous parody "Ha-Yareaḥ" (Berdychev, 1895), which has the form of a periodical. There are also large numbers of perverted proverbs and modified maxims which must be classed with parodies. The largest collection is the "Ben Mishle" of H. Scherschewsky, published in several periodicals. Zedner, Cat. Hebr. Books Brit. Mus. s.v. Purim, pp. 644-645.